In this edition of future Montreal projects, we will look at the taller skyscrapers that will be rising up in the city in the near future. 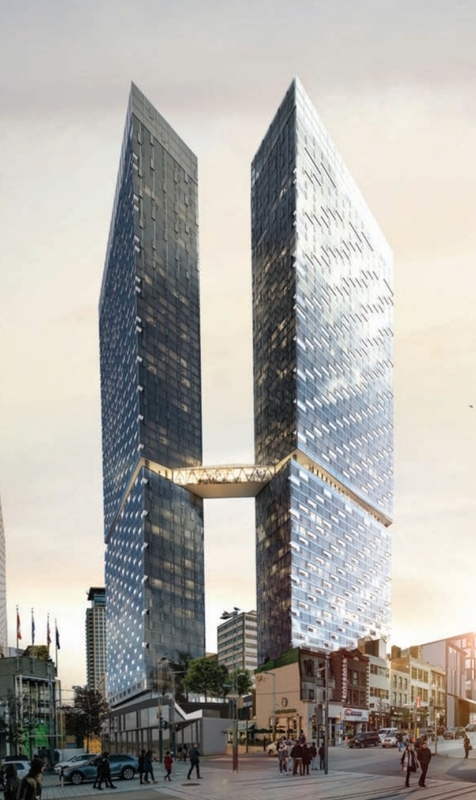 From adding more depth and density in the Bell Centre district to the future Victoria Sur Le Parc, Banque Nationale’s new Headquarters, Maestria and others, the city is witnessing a new era, highrise living. Of course, this is new to the city but it also has many benefits. More people live downtown, highrise living is more sustainable for the environment, promotes walking and transit usage and also leaves more space for potential green spaces. Here we will look at current proposals and even visions of future developments. 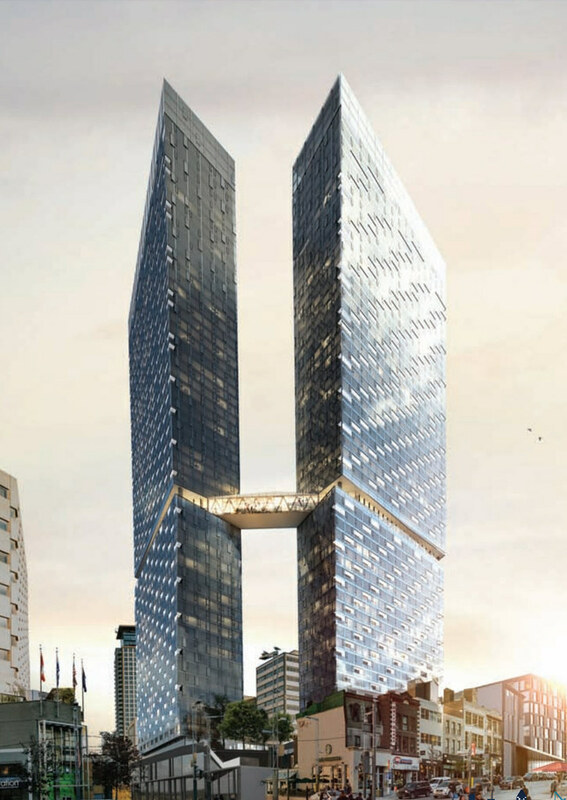 The fourth proposed tower to rise in the new Bell Centre cluster will be located between the CGI office building and the soon to be 1000 De la Montagne project to the right. Behind this tower is where Solstice will rise. At 128 metres, it will fit perfectly with its surroundings (CGI building is 119 metres tall, Holiday Inn 120m) and will add to a staircase effect going taller the further south you go. Béïque-Legault-Thuot are the rumoured architects for this project and there’s a good chance the lower levels can have some office space. Out of all the visions presented in this post, this one has the highest chance of becoming reality. Since the late 1980s, there has always been speculation about the empty lot next to the SNC-Lavelin Headquarters. 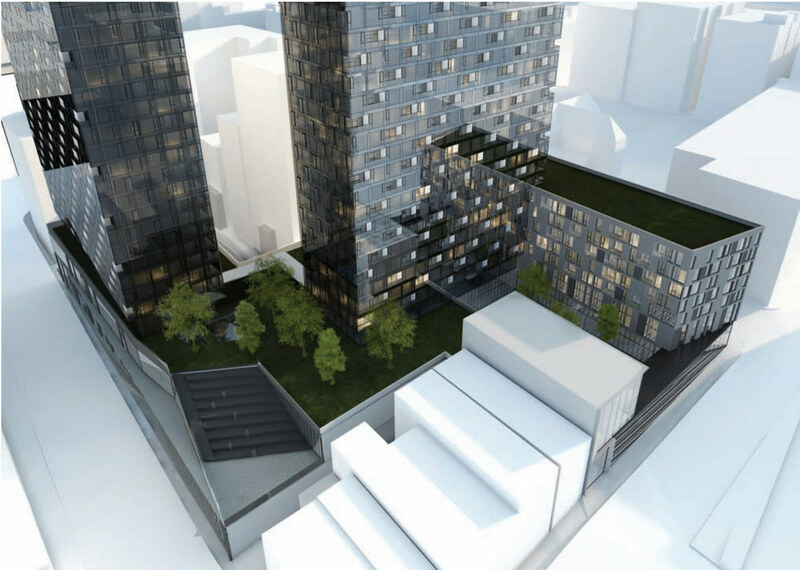 According to consultation documents released this month, it looks like we can see a 42-floor and 52-floor condo or mix-use towers. That is all we know for now. More updates will follow for yet another massive project downtown. This project will bring a second life to the historic Club Sportif MAA. The MAA agreed to have a condo built on top of its current office while preserving and restoring the facade, which has been around since the early 1900s. The project shows how highrise living has spread to other parts of downtown and bringing more life to other sectors in downtown Montreal. The tower will include condos, suites and penthouses and sales will start Spring 2019. This project is located on the former Domtar Garden park and one of the entrances to Place des Art’s metro station. The tower will be mixed use (143 hotel rooms and 252 rental apartments) and has already started construction. There hasn’t been any news on which hotel will occupy the bottom floors or apartment names but once announced, there will be another update to follow. Although people were sad that Domar Garden doesn’t exist anymore, the parking lot across from this project will become a green space. Although announced in November, this massive project will add yet another icon to the Montreal skyline. The $700 million project will include 936 condos, 700 rental units, ground level commercial shops, an event space and much more. Furthermore, the project will have a sky bridge on the 27th-floor which will make it a unique project for the city. Maestria is set to go on sale in the Springtime, with construction starting end of 2019 and will add depth and yet another signature at Place des Arts. Currently, there is activity on site for the sales office. I would also like to note that this project has officially replaced La Tour QDS (pictured below), an office tower that was going to add between 1.1-1.2 million sq ft of class A office space downtown. There are a lot more projects on the pipeline and things are starting to heat up after a slow start this year. The slow start is due to the holidays in December/January which is normal and understandable. More updates will follow suit after this one since a few major projects on the table have yet to be announced. 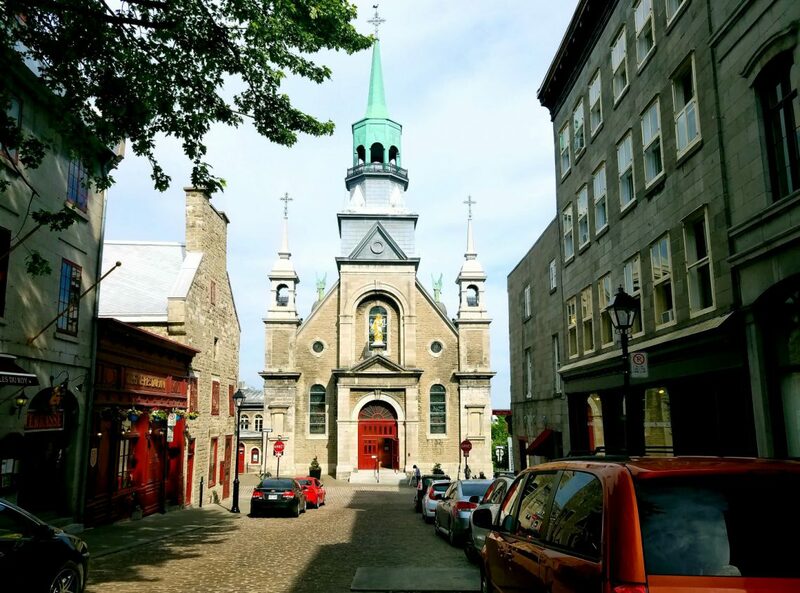 Previous Future Montreal Projects: Focusing on smaller scale projects. Love finding your updates through Reddit Chris! We hope to buy a condo there before it becomes as expensive as Vancouver. Cheers! Glad you enjoy the updates Mankhool! have no fear though, besides a few projects, prices have remained relatively stable here.